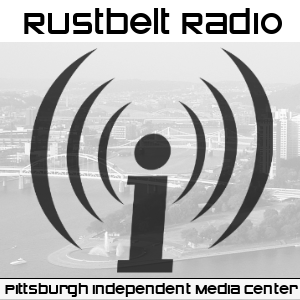 Pittsburgh Indymedia's weekly radio program featuring news from the grassroots, news overlooked by the corporate media. Click below to play a recent show in your web browser. and show archives always available on our website at radio.indypgh.org. If you'd like to get involved in producing news stories or to submit your story, please email radio@indypgh.org. We can also use help with copy editing, interviewing, and hosting! Rustbelt Radio is supported in part by a Sprout Fund seed award. The Sprout Fund is nonprofit organization supporting innovative ideasand grassroots community projects that are catalyzing change in Pittsburgh. Each of The Sprout Fund's programs, Seed Award and Public Art, is designed to advance a community initiative from idea through dialogue to implementation, creating a critical mass of activity for positive regional change. Sprout believes a vital component to building healthy and vibrant communities is civic engagement; serving those who demonstrate the drive and the capacity to think creatively about their communities. With ongoing local support and continued appreciation by the communities it serves, The Sprout Fund will continue to provide an entry point for Pittsburghers to become involved and active in their communities and support projects that have the collective power to shape a new culture and vision for the region. We also rely on listener support. We appreciate equipment donations and funds - thanks to all of our supporters for supporting us this year! 100% of donations go towards production expenses and equipment for our volunteers. You can donate instantly online at the paypal link below. Today in celebration of earth day, we bring you a report from statewide grassroots protests demanding that the Pennsylvania DEP put environmental safety above corporate interests, and we bring you a special feature on corporate land-grabbing in Africa, and its implications for food security and environmental health. Ujamaa collective hosts a discussion on the new book "We Have Not Been Moved", essays on race and political struggle in America. We bring you a report on the impacts of Hurricane Sandy in the Northeast, and how communities are coming together to respond. A Look at a Controversy Rising Between East End Developers, and the Shadow Lounge. The Pennsylvania Prison Report and an update on Juvenile Lifers Without Parole in the state. On today's show we look back over our last 8 years and also remain focused on the present while we touch on issues of health care, the prison system, transit, the Fourth of July and more. Pennsylvanians are fighting back against the impacts of shale gas drilling---a mobile home community in Lycoming County fights eviction, and people in Butler speak out against Act 13. Rustbelt continues its coverage of the so-called "Bloomfield Bridge Riot"
Activist, scholar and writer Dr. Leanne Betasamosake Simpson of the First Nation Anishinabek people answers the question: "Can Aboriginal Traditional Knowledge Survive in the Modern World?" A report from Black Agenda reporter, Glen Ford, on the Supreme Courts decision to allow strip searches without reasonable suspician. Updates of prisoner abuse and resistance from inside the prison industrial complex. A follow up to the last show's feature on Juvenile Life Without Parole at the recent Supreme Court hearings. We examine the issue of juvenile life without parole. We examine the impact of the Marcellus drilling industry on forest ecology. We hear about the work of prison doulas who support pregnant women behind bars. An update about Japan's recovery one year after Fukushima and the Obama Administration's nuclear plans. We examine air quality impacts of the Marcellus industry, as Allegheny County's first Marcellus compressor station permit is now under review. The government subpoenas an Occupy Wall Street activist for his Twitter records. We air an interview from Fairness and Accuracy in Reporting about Apple and coverage of Apple with longtime workers' right advocate and researcher Jeff Ballinger. We hear from local activist, Brittany McBryde, on her new documentary, "The Image of Black Women"
On today's show we bring you a special year-in-review episode, highlighting our best stories from 2011. We bring you "Calls From Home" a special holiday program which brings the voices of family members of prisoners to the airwaves as they send greetings to those incarcerated in the US prison system. A new program in Uptown teaches African-American youth about the environment and entrepreneurship. Updates from occupations across the U.S. and around the world. Interviews with famed sports journalist, Dave Zirin. Prison activist Robert King on the Angola Three and prison justice issues. Environmental scientist and activist Sandra Steingraber offers strategies for the movement against shale gas drilling. Fifteen hundred gather in Philly to protest shale gas drilling, even as flooding threatens to spread contamination from drilling sites. Journalist, Glen Ford, points out the similarities between the treatment of blacks in London and the U.S.
We hear about the inadequacies in the coverage of the Fukushima nuclear disaster. And more in our local and global headlines. The Third Circuit Court of Appeals holds up limits on Media Consolidation. A report from the March on Blair Mountain, against mountaintop removal. We go to a West Virginia rally against mountaintop removal, where Josh Fox and Mari-Lynn Evans draw connections to the anti-fracking movement. Hip-hop artists Jasiri X and Paradise Gray ask, Is Pittsburgh Really America's Most Livable City? excerpts from a talk given by Diana Block on her book "Arm the Spirit"
Shalefields Grassroots Media investigates the impact of Marcellus drilling on sustainable farming in Pennsylvania. We bring you an on-the-ground report from the ongoing protests in Wisconsin. On today's show we bring you a special holiday broadcast from Thousand Kites, a national dialogue project addressing the criminal justice system.